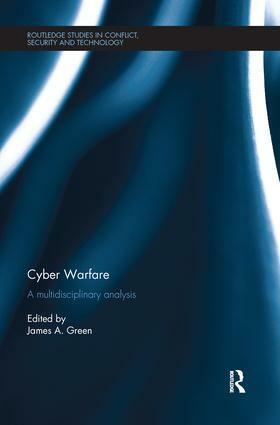 This book is a multi-disciplinary analysis of cyber warfare, featuring contributions by leading experts from a mixture of academic and professional backgrounds. Cyber warfare, meaning interstate cyber aggression, is an increasingly important emerging phenomenon in international relations, with state-orchestrated (or apparently state-orchestrated) computer network attacks occurring in Estonia (2007), Georgia (2008) and Iran (2010). This method of waging warfare – given its potential to, for example, make planes fall from the sky or cause nuclear power plants to melt down – has the capacity to be as devastating as any conventional means of conducting armed conflict. Every state in the world now has a cyber-defence programme and over 120 states also have a cyber-attack programme. While the amount of literature on cyber warfare is growing within disciplines, our understanding of the subject has been limited by a lack of cross-disciplinary engagement. In response, this book, drawn from the fields of computer science, military strategy, international law, political science and military ethics, provides a critical overview of cyber warfare for those approaching the topic from whatever angle. Chapters consider the emergence of the phenomena of cyber warfare in international affairs; what cyber-attacks are from a technological standpoint; the extent to which cyber-attacks can be attributed to state actors; the strategic value and danger posed by cyber conflict; the legal regulation of cyber-attacks, both as international uses of force and as part of an on-going armed conflict, and the ethical implications of cyber warfare. This book will be of great interest to students of cyber warfare, cyber security, military ethics, international law, security studies and IR in general. Introduction, James A. Green 1. A Short History of Cyber Warfarem Richard Stiennon 2. Understanding Cyber-Attacks, Duncan Hodges and Sadie Creese 3. The Attribution of Cyber Warfare, Neil C. Rowe 4. The Strategic Implications of Cyber Warfare, Danny Steed 5. The Regulation of Cyber Warfare under the Jus ad Bellum, James A. Green 6. The Regulation of Cyber Warfare under the Jus in Bello, Heather A. Harrison Dinniss 7. The Relevance of the Just War Tradition to Cyber Warfare, David Whetham and George R. Lucas Jr.
James A. Green is Associate Professor of Public International Law at the University of Reading. He is author of The International Court of Justice and Self-Defence in International Law (2009), and co-editor of Conflict in the Caucasus: Implications for International Order (with C.P.M. Waters, 2010) and Adjudicating International Human Rights: Essays In Honour of Sandy Ghandhi (with C.P.M. Waters, 2015).